Included with Reason is a huge sound bank full of inspiring instruments, synth patches, loops, and effects. Patches have been created by producers like Death Cab for Cutie's Jason McGerr, Bomb Squad's Hank Shocklee, Black Eyed Peas' Printz Board, DJ Lucky Date, Kill the Noise, and more. ?Hardware Interface ?The Hardware Interface handles the connection between software and hardware and supports up to sixty-four separate outputs. As it is integral to Reason's functionality, it cannot be removed. ?Mixer 14:2 ?Reason's mixer is used to group numerous device outputs into a stereo output. It has fourteen stereo channels with level meters, fixed bass and treble EQ and four stereo auxiliary sends. It is possible to mute or solo any given channel, as well as alter its level, pan and auxiliary output level. The console has chaining master inputs to allow several line mixers to be daisy chained together, effectively allowing for an unlimited number of channels. ?Line Mixer 6:2 ?Similar to the Mixer 14:2, and also known as the Micromix, it is a smaller, six channel mixer, with only one auxiliary send and return, no EQ, smaller level controls and limited metering. ?Subtractor Analogue Synthesizer ?Subtractor is a polyphonic synthesizer device based on subtractive synthesis, which is the method used in classic, analog synthesizers. Its two oscillators can produce basic waveforms such as square, sawtooth, triangle, and sine. Additional waveforms based on samples can also be generated. The Subtractor device can be completely automated from a controlling device, such as Reason's sequencer. ?Thor Polysonic Synthesizer ?The Thor device simulates a semi-modular synthesizer. Six filter and oscillator slots let you load up three different filter modules and three different oscillator modules simultaneously, allowing you to dial in novel sounds. A modulation matrix gives you complete control over your signal flow, letting you modulate anything within Thor. Thor also has a simulation of an analog style step sequencer with more than one twist. ?Malstrom Graintable Synthesizer ?The Malstrom device creates its sounds using Graintable technology. This technology is a cross between granular synthesis and wavetable synthesis. Malstrom features many filtering and modulation options. It is capable of real-time waveform stretching, spectral modulation, and wavetable sweeping. Malstrom comes with a wide range of Graintables. ?NN-19 Digital Sampler ?The NN-19 device is Reason's original sampler, introduced in the first version. All of the controls on the NN-19 can be fully automated from a controlling device. There are two ways of getting sound out of NN19: load a single wav/aiff sample or load a sampler patch. Loading a single wav/aiff file will instantly transpose the audio across the keyboard by speeding up or slowing down the playback of the sample. The NN19 can import and play mono or stereo files. ?NN-XT Advanced Sampler ?The NN-XT device is an advanced sampler with many features. It is designed for working with multiple samples which can be assigned to different keys on the keyboard. It can be used for both sound design and instrument emulation. Useful features include alternate sample playback, auto-pitch detection, keyboard zones with individual parameters, and tempo syncable LFOs. ?Dr. Octo REX Loop Player ?This update of the Dr.Rex device, the Dr. Octo Rex Loop Player plays back samples created by the ReCycle (program) in the .rex and .rx2 formats. These formats allow for manipulation of the sample's tempo without affecting its pitch. Imagine that you have a sample of a drum loop. The loop is 144 bpm and your track is 118 bpm. Instead of stretching the sample, which would change the sample's timbre and pitch, ReCycle slices the loop into little pieces so that each beat gets its own sample. ReCycle also creates a MIDI file with the samples played the way the loop was originally played. ?Redrum Drum Computer ?The Redrum device is a sample-playback drum module with a built in pattern sequencer. It has ten channels that plays samples loaded individually or from a preset kit. In addition to the pattern sequencer, Redrum can also be played from Reason's main sequencer or via MIDI. ?MClass Equalizer ?The MClass Equalizer is a 4-band, professional level mastering EQ with low and high shelving bands, two peak filters and a low cut switch. The MClass Equalizer lets you make subtle or drastic frequency adjustments to the audio. ?MClass Stereo Imager ?The MClass Stereo Imager splits the incoming audio into low and high frequency bands, and lets you adjust each independently. ?MClass Compressor ?The MClass Compressor is a single-band compressor with a sidechain input for advanced compression such as ducking or de-essing, and CV out for dynamically controlling other devices. ?MClass Maximizer ?The MClass Maximizer is a tool designed to maximize the volume of your Reason tracks, without crushing them or introducing other unwanted artifacts. ?RV7000 Advanced Reverb ?The RV7000 contains basic reverb controls located on the main panel, and eight separate knobs for algorithms and their parameters, which can be accessed from a fold-out remote when pressed. ?Scream 4 Distortion ?With Scream 4's cut and body filters, two parameters for its ten modes including overdrive, distortion, feedback and tape damage, you can use it for digital bit crushing, or regular crushing, or for simulating adding analog warmth to audio. ?BV512 Digital Vocoder ?The BV-512 is a 4 to 512-band vocoder that can modulate sound in several ways, and can also be used as an automated equalizer. 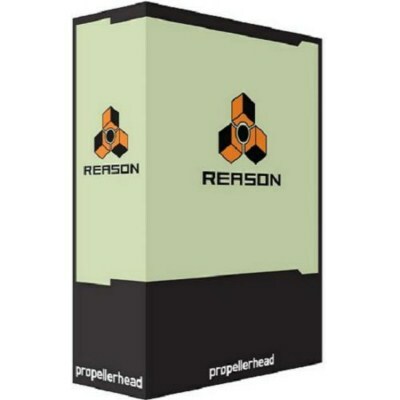 Propellerhead Reason 6.0.2 Mac OS X Download via Hotfile Rapidshare Fileserve Megaupload & FileSonic, Propellerhead Reason 6.0.2 Mac OS X free torrent downloads included crack, serial, keygen.